Fancy a bit of Wild West action? 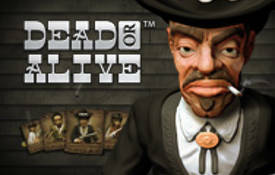 Dead or Alive sports 5 reels and 9 paylines, it is an action-packed video slots released by Net Entertainment. 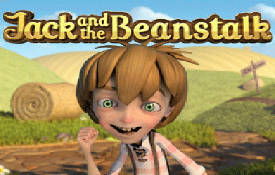 It comes with the usual wilds, scatters, free spins, some of the meanest villains (Billy the Kid and Jesse James) of the Wild West and offers a non- progressive jackpot win of €54,000 during the Free Spins round. 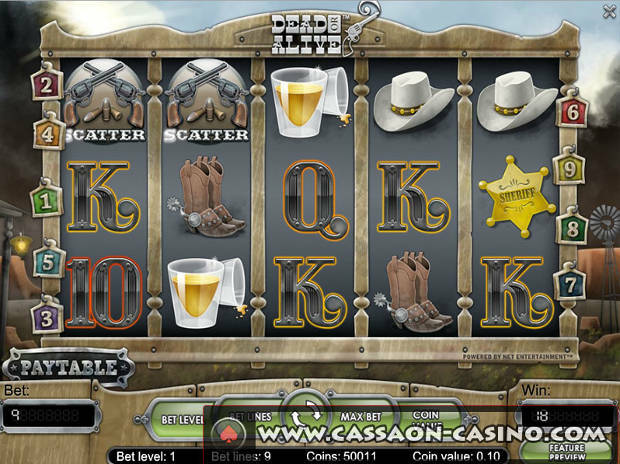 Icons that appear across the reels are The Sheriff’s Badge, Cowboy Hat, Whisky Glasses, Guns with Holsters, Cowboy Boots, Two Guns with Bullets (Scatter) and a Wanted Dead or Alive outlaw poster (Wild symbol). Poker symbols from 10 to Aces also appear across the reels. Before I continue with the review, I’d like to give you a brief overview of the game’s customization options. It’s divided into 4 Bet Levels. The bet level is proportional to the amount of coins; the minimum is 9 and the maximum is 36 coins per payline. Right next to the bet level is the Bet Lines. You can decide how many bet lines you want to activate. The minimum bet line is 1 and the max bet line is 9. The last feature is the Coin Value. It ranges from €0.01 to €0.5. 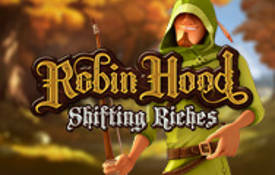 The minimum bet per spin is €0.01 and the max bet per spin is €18. In the left hand corner of your screen you’ll note a small spanner icon. When you click on it you can set the audio settings. Between the ”Bet Lines and ”Max Bet” you’ll see circular arrows. Not only does it spin the reels but you can also stop the reels whenever you like. The main draw card (pun intended) of Dead or Alive is its Free Spins Bonus game. It’s triggered by 3 or more revolver scatter symbols which doubles all wins. 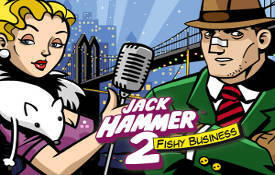 12 Free Spins will be awarded with a multiplier of 2x. Another interesting feature is the ‘Sticky Wilds’. 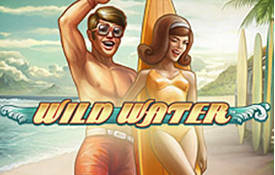 Wilds remain sticky for the remainder of the free spins awarding an extra 5 free spins if there’s one on each level. All the other symbols are substituted except the scatter. When this happens the bonus round can be very lucrative indeed. When playing Dead or Alive video slots try and hit the sticky wilds during the free spins. 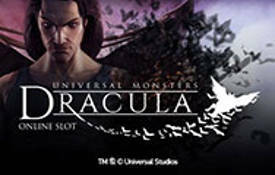 I played the game in the free mode and won €300. 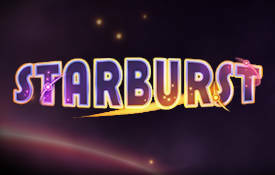 Unfortunately I could not activate the Free Spins bonus game. Overall the slots is not as tight as some of the NetEnt slots I’ve played. That said, don’t expect wins too often, if you persevere you might land a couple of decent wins. Dead or Alive offers a return of 95% to the player (RTP). We recommend you play Dead or Alive at these Net Entertainment Casinos.